Mrs. Dyer will take our year 2 class out and about in Gelli as part of the Georgraphy locality project. We will be looking at the main features of Gelli using observational skills and discussion. Please will you make sure that you sign and return the permission slip so that Mrs. Dyer can take all the chidlren with her. Click on the Year 2 page later this week to see what they got up to. A tooth brushing project will be starting in your child’s class on Monday 28th April. An Oral Health Educator from Rhondda Cynon Taff Teaching Local Health Board will visit the school regularly to talk to the children about the correct tooth brushing methods, diet advice and visiting the dentist. Each child involved in the project will be given their own tooth brush to keep in class and will participate in supervised tooth brushing as part of the school day. A parental consent form must be completed before participation in this project. This can be downloaded fom the Prospectus page on the school website. Click here to access each newsletter that is published. Safety outside the school and in the car park. Earlier this year I asked parents not to use the school drive as a footpath as cars entering the school will be unaware that pedestrians are using this and accidents are likely to occur. I understand that this may be inconvenient to some of you, especially those who live down the valley. BUT ….. several parents and grand parents insist on ignoring this request. I have been required to undertake a risk assessment of the car park and school surroundings by the LEA and I regard this as a significant risk. I have reminded the children in assembly that this is dangerous and their safety is at risk. They have promised to obey this rule and I now ask you as parents, grand parents and carers to help me. On Friday I went out to the car park and monitored this and was very pleased that the children took the lead and asked you to make the long walk along the path. In addition, I was very pleased to hear the views of some parents. They informed me that there are several other issues that we may need to address. There is illegal parking on double yellow lines and pavements outside the school. This is adding to the risk of accidents. Some parents are parking pushchairs and buggies outside the nursery and year 1 exit and making it difficult for parents to pass to collect the Year 2 and Junior children. Please can I ask parents with buggies to be more tolerant and make room for parents to pass to collect their children from the main entranceAt Gelli Primary we have tried to address the problem of collecting children from school by changing the end of the school day for Junior children to coincide with that of the infants. We also have an enclosed area where it is possible for parents to meet children safely outside the school gates. One solution is that I lock the front gates which may solve one problem but create others. Can I remind you that the children’s safety is paramount! I would appreciate your co-operation in this matter. Click here to see who received Head Teacher Awards this morning. As you can see, the Gelli Primary School Blog has had a facelift. In order to replicate our school colours, a new blue backround and colour scheme has been adopted. Tell us what you think by adding a comment here. There is no school today due to industrial action being taken by members of the NUT. School re-opens as usual tomorrow Friday 25th April. Breakfast Club is open as usual. What do we think of the new dinner arrangements? Since Easter we have been trailing some initiatives to further improve the arrangements for dinners at Gelli Primary School. The Canteen Staff led so wonderfully by Mrs. Edwards and the Lunchtime Supervisors have been putting a new plan in place. So what do you think? We need to receive some feedback to the School Council so that we can agree a new policy as part of our Healthy Schools action plan. We will ask you to answer these questions as part of our survey. Do you like the new four week rotation? Do you have more choice now, salad bar and dinner? Is there enough room for everyone to eat packed lunch? Which do you prefer, flight trays or plates? Click on the comments page and leave us your thoughts. The Parent Association has an account with this company where the PTA receive commission on all sales made either via their catalogue or through the website. Click on this link to browse the catalogue. When you see things you like, you can add purchases to your basket. The commission is calculated and issued to the PTA every couple of months. If you need birthday presents or other gifts for primary school children, these items are very good value for money and are very educational as well. If you have purchased materials from this for the PTA, please leave a comment for prospective purchasers ..... and remember .... every purchase helps us raise funds for the pupils. Amelia Roberts, Alfie Dunning, Amy Sparrow and Honey Saunders in Nursery for making a big impression starting school. Mia Squires for excellent progress in reading. Joel Evans for always working hard and trying his best & Thomas Sims for being a good role model. For the WHOLE of Year 2 for showing enthusiasm in their new topic "Round and round the garden. They've brought in gloves, tools, wheel barrows and other equipment. Well done. Sophie Reed and Michael Goodwin for showing enthusiasm for our Egyptian project. Kirtsy and Kelsea Eddy for a great improvement in their reading and handwriting. Elizabeth Roach for her enthusiasm during the BT Rangers project. Carwyn Edwards for researching his history project. At Gelli Primary School we take the issue of child safety very seriously. This includes the use of images of pupils in the media, in school publications and on the school website. You may also have seen a number of articles in the Rhondda Leader. The inclusion of these images in such publications is motivating for the pupils involved, and provides a good opportunity to promote the work of the school. However, schools have a duty of care towards pupils, which means that pupils must remain unidentifiable, reducing the risk of inappropriate contact, if images are used in this way.We ask for parental consent in order that the school can take and use photographs and images of their children. It is our policy never to include the full name of the pupil alongside an image. Wherever possible we will frame the shot to minimise the potential for the image to be inappropriately used. 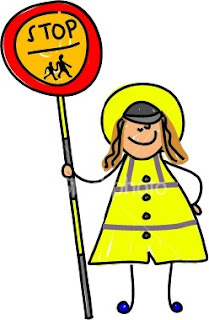 If you DO NOT CONSENT to the school using digital images of your child in any publication that Gelli Primary School will produce, please complete, sign and return a form that is available from the secretary and is downloadable from here and return to school as soon as possible. We shall assume that if you do not return a form to us you are happy to abide by our policy. Planned Industrial Action by the National Union of Teachers on Thursday 24th April 2008. I have been informed by members of the National Union of Teachers (NUT) that they will call a national one day strike on Thursday 24th April 2008. This will result in the school being closed on that day for ALL pupils. I have been required to undertake a risk assessment by the LEA which has resulted in my decision to close the school to pupils on that day. I have not taken this decision lightly and have consulted with the Chair of Governors at every stage and we feel that we have no option but to close on Health and Safety grounds. I understand that this will cause some difficulties for parents, but am informing you at this early stage in order that alternative child care arrangements can be made by yourselves for your children. I am reliably informed that most of the schools in this cluster have to make similar arrangements to us. Members of staff that are not involved in the industrial action will be in school but are unable to carry out duties outside their job descriptions. between 11.00 p.m. and 2.00 p.m.
Visit the PTA page on the school website and please print out as many copies as you can and distribute to your work colleagues, neighbours, friends and family. During the coming days each teacher will be preparing a document which will outline what your child will be studying this term. It’ll be published on your child’s class web page on www.gelliprimaryschool.org.uk/. You will never have to ask the question "What did you do in school today?" and receive the answer "nothing!" Please ask the children what they are studying in each subject and show them that you are more aware of what went on in school. Please put comments on this page if you find this useful. Please leave a comment on this initiative by clicking on the Post a comment link. Here are some advanced dates for you to put in the diary. 17th April Year 6 BT rangers project. 21st April Year 4 trip to Caerphilly Castle and Castell Coch. 22nd April Pre school club in the hall 2.30 – 3.10 p.m.
28th April Under 5’s dental project. 8th May Year 5 visit Environmental show in Pontypridd Park. 9th July Leaver’s Ball – Ton Pentre Football Club. 18th July END OF TERM. Further update will be posted when available. The activities associated with the Jump Rope for Heart programme have had to be postponed at the very last minute. I do apologise for this, but several unforeseen circumstances made this decision unavoidable. We will re-schedule these during our Focus week which will take place during the week beginning Monday May 12th. More details will follow when available. If you have already filled in and returned your sponsor forms we will retain them until then. The new lunchtime schedule is proving to be very successful. We have now managed to feed all children by 12.25 p.m. and the packed lunch children can opt to eat at the tables in the hall or eat their lunch outside. My thanks go to the lunchtime supervisors and Canteen staff for their co-operation. As you are aware all monies for dinners have to be received in advance. I would ask your co-operation in this matter as the Authority has issued strong guideline and are insisting that no child be issued with a meal if their account is in debt. This can sometimes be very embarrassing for the children and us. Please can we ensure that all dinner money is sent to Mrs. Thomas on Monday morning in the appropriate envelope. Possible strike action by members of the NUT. You may have read in the press that the NUT are proposing to take strike action on Thursday April 24th. I will inform parents of any disruption to school as soon as I have any information. This will be available by pupil post and in electronic form on the blog and on the website. There is a meeting of the PTA in the Ton Pentre Football Club on Wednesday 16th April at 7.00 p.m. 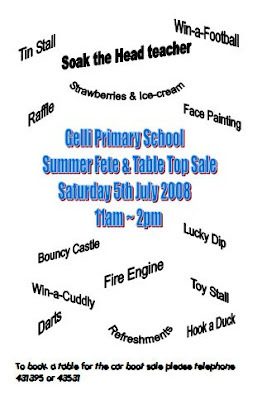 The main item on the agenda will be preparations for the School Fete on Saturday July 5th. If you are able to make this meeting we always welcome new members. Remember, many hands make light work. The photographs taken by the photographer are awaiting collection from the school office. Please collect them from Mrs. Thomas as soon as possible. The pack is priced at £9.50. Over the past few weeks I have been building up a website for the school which will be developed as the term progresses. It will give parents the opportunity to view important information and documents on line. In addition I hope that the children will be able to contribute some of the work that they undertake in class to the class pages. Any significant updates will be publicised in forthcoming newsletters. As there are so many of our parents who either access e-mail from home or at work, I can keep you up to date with developments at Gelli Primary School via e-mail updates. If you would like to receive e-mail updates from us, please send an e-mail to head.gellipri@rctednet.net with Receive e-mail updates in the subject box. Please put your name, your child (ren's) name and their year in the body of the e-mail and send to me. You will then receive periodical e-mails and updates. This has proved to be a very effective way of communicating up to date information to parents. The staff will be undertaking two days of training on Monday 7th April and Tuesday 8th. School will recommence on WEDNESDAY. Photographs will be available for collection on receipt of the £9.50 fee per pack. Please collect these from Mrs. Thomas.